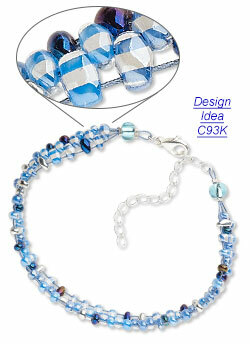 Though small in size, Czech glass beads fascinate us with their mighty history. The story of Czech glass beads begins in the 3rd century BCE, when Celtic craftsmen began to produce the first glass beads in Bohemia, now known as the Czech Republic. These beads were of great value for trade and personal ornamentation. Over the next several centuries, glassmaking techniques progressed internationally, perfected in particular by the Italians. With the expansion of trade and the global exchange of ideas, Czech artisans adopted revered Italian techniques and through extensive experimentation, uncovered secrets the Italians were less than willing to share. Extraordinarily inventive, Czech glassmakers also cultivated their own glassmaking techniques. 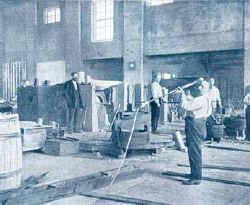 Among the most significant were their unique contributions to the process of molding glass to create pressed glass beads, fire-polished finishes and mass production of their products. In the pressed glass process, hot glass is placed in a mold, then cooled, polished and drilled. This glassmaking method was perfected in the early 18th century and within a few decades Czech glassmaking dominated the world markets. Continually advancing up through the 21st century, this manufacturing process has been transformed into a high-tech industry. There were several important reasons why glassmaking expanded in this region of Bohemia. Along with excellent proximity to trade routes, this area provided ample natural resources required in the glassmaking process including water, forests, sand and quartz. In addition, the region was home to incredibly skilled glassmakers and imaginative, risk-taking entrepreneurs. In the middle of the 16th century, Zásada, a small village in the kingdom of Bohemia, became the home of a new glassworks factory. Zásada is located in the region of Jablonec nad Nissou, the epicenter of Czech glassmaking. From this village, Czech glassmakers first expanded their trade, exporting glass beads around the world. Today, Czech glass is primarily produced by the renowned manufacturer Preciosa in high-tech, industrialized bead factories. However, the intense labor required to make glass beads, before the current industrialization occurred, is truly hard to conceive. 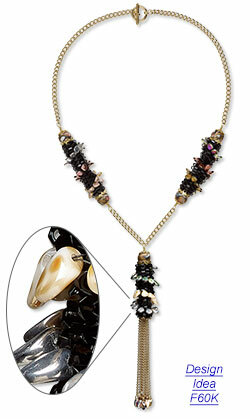 Initially, glass beads were painstakingly cut by hand with knives, then hand polished one bead at a time and strung. This cottage industry, located in the mountains of Bohemia, was the region's primary mode of commerce for centuries. 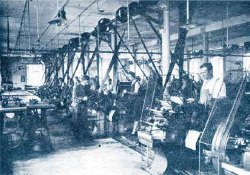 Small family dwellings frequently housed as many as four to six bead-cutting and polishing machines. Often, there was no room left for furniture and it had to be stored in the attic. Finished beads were sold strung in bags or bundles and entire families were employed to string them. It wasn't until the 1830s that machines were invented for glass bead production. In the 19th century, Josef Riedel, known as the glass king of the Jizera Mountains, settled in the area and built an immense glass company which offered a notable 19 bead sizes, including seed beads, and a selection of over 200 colors--all created with the latest in mechanization. Ever inventive, Riedel built a factory to produce mechanically cut, perfectly round seed beads, which the Italians had already been producing. Hand-cutting and polishing was now being replaced by machines. The newer automated production dramatically increased output, while maintaining quality and consistency. Czech glass beads were gaining popularity exponentially and global demand was rising, as a result of powerful, determined merchants from the region. By the end of the 19th century, the world had fallen under the spell of Czech seed beads with the Jablonec nad Nissou region as the primary location for production and export of these beads. Today Preciosa, based in Zásada, is the largest producer of glass and seed beads in the world. They manufacture a staggering 3.5 million kilograms annually, along with over 255,000 types of beads. 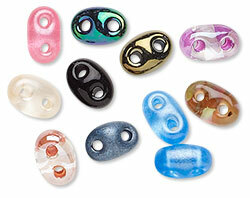 Beads, and our bead designs, unite us with others from the closest to the furthest points around the globe. As beads are connected with a wire or string, each of us is connected with those who love to wear or create with them. They are a joyful language without barriers, spoken between people around the world for over 100,000 years. A new industry emerges as workshops and ateliers for glassmaking begin to pop up across Northern Bohemia's majestic Jizera Mountains, at the heart of which is a small town called Jablonec nad Nisou, and the Crystal Valley is born. Bohemian jewellers and craftsmen begin making the first glass bead necklaces, which quickly become a sought-after commodity among Bohemian and Saxon aristocracy for their exquisitely polished and perfectly cut stones. A new, pristine, clear glass, practically indistinguishable from natural mountain crystal, is created and hard enough to be polished for brightness. Bohemian glassmakers discover the art of melting coloured glass. Georg Friedrich Strass, an Alsatian jeweller, invents the first ever rhinestone (artificial gemstone) from a special type crystal found in the Rhine River. The art of coloured glass stone-making and cutting is refined, which leads to the introduction of imitation gemstones and new spectacular pieces of jewellery. Less than two decades after the first school of glass is founded in the Crystal Valley, the first school of glass jewellery is founded in Jablonec nad Nisou. The World Exhibition in Paris brings with it a newfound demand for ‘diamond jewels' that can be sewn onto clothing. Crystal Valley glassmakers respond, creating a glass component with a ‘silver mirror' on the underside of the stone, known today as foiling paper. Bohemian glassmakers revolutionize the jewellery making industry by introducing a new technique of fastening crystal components into metal jewellery cups. Machine-cut jewellery stones, known as chatons', are for the first time produced on proprietary cutting and polishing machines, resulting in a boom of new designs and applications. 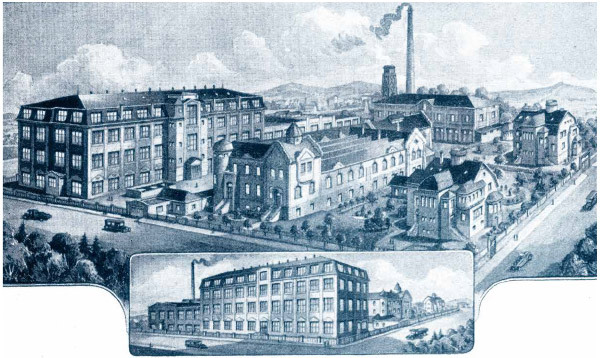 Preciosa is officially established in the wake of World War II when 25 small, medium and large-scale companies and factories scattered throughout the Crystal Valley merge together into one national company in Jablonec nad Nisou, where Preciosa is still headquartered today. Preciosa founds the Research Institute of Glass and Jewellery in Jablonec nad Nisou, which today serves as an integral part of the company and remains one of the most respected R and D facilities in the glass industry. Preciosa introduces its trademarked Hi-Pure Crystal technology for an even more defined brightness as well as its Dura-Foiling process, which allows for better adhesion and stronger durability during secondary manufacturing. After more than three years of development, Preciosa introduces its premium MC Chaton Rose MAXIMA line. Capable of reflecting up to 264 unique rays of light - the most of any competing product available on the global market - this new crystal becomes the shiniest in the world.